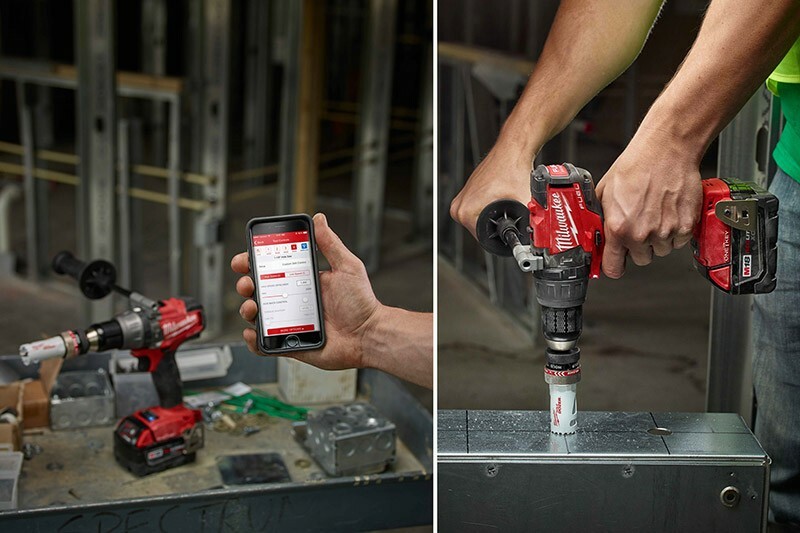 Milwaukee One-Key is a new feature that Milwaukee announced back in September that allows One-Key enabled tools to communicate wirelessly with smartphones running the One-Key App. While the App was released in September, since no One-Key enabled tools were available, it was only really useful for tool inventory management. That is all about to change February 2016 when the first One-Key enabled tools with Tool Control will hit store shelves. These first One-Key Tool Control tools will be a selection of M18 Fuel Drills and Impacts. If you recall back to our initial article about Milwaukee One-Key, Tool Control is the most exciting feature about the One-Key system, behind Inventory Management and Tool Reporting, and it is the final stage in their One-Key rollout. What makes Tool Control so special is the ability for users to customize their drilling or fastening needs for specific applications by setting the torque and speed to match what is needed. Profiles can be created for each drilling or fastening need, or you can use pre-programed setups to match common applications like driving self-tapping screws, concrete anchors, or hole-saw drilling. I imagine that as Milwaukee’s One-Key Tool Control becomes more popular, manufacturers will actually list the settings they recommend to drive their fasteners or to drill into specific materials. It could be as easy as using the One-Key App to read a QR Code on a new box of screws to import the recommended setup, but that is just me thinking ahead. People throw out phrases like “game-changer” far too often for things that are new, but Milwaukee truly has changed the game with One-Key. As you probably guessed, the new One-Key enabled tools will be Milwaukee’s top-of-the-line products and will feature their Redlink Plus technology along with Powerstate brushless motors, and Redlithium Batteries. In fact, kits will be available with the larger 5.0Ah batteries or 2.0Ah batteries. Of course, they are also offering bare tool options as well. 2705 M18 FUEL 1/2" Drill/Driver with ONE-KEY,(2) M18 HIGH CAPACITY REDLITHIUM XC5.0 Battery Packs and Multi-Voltage Charger. Also available as a bare tool (2705-20). 2706 M18 FUEL 1/2" Hammer Drill with ONE-KEY,(2) M18 HIGH CAPACITY REDLITHIUM XC5.0 Battery Packs and Multi-Voltage Charger. Also available as a bare tool (2706-20). 2757 M18 FUEL ¼” Hex Impact Driver with ONE-KEY,(2) M18 HIGH CAPACITY REDLITHIUM XC5.0 Battery Packs and Multi-Voltage Charger. Also available as a kit with REDLITHIUM 2.0 Compact Batteries (2757-22CT) and as a bare tool (2757-20). 2758 M18 FUEL 3/8” Compact Impact Wrench with ONE-KEY,(2) M18 HIGH CAPACITY REDLITHIUM XC5.0 Battery Packs and Multi-Voltage Charger. Also available as a kit with REDLITHIUM 2.0 Compact Batteries (2758-22CT) and as a bare tool (2758-20). 2759 M18 FUEL 1/2” Compact Impact Wrench w/ Pin Detent with ONE-KEY,(2) M18 HIGH CAPACITY REDLITHIUM XC5.0 Battery Packs and Multi-Voltage Charger. Also available as a bare tool (2759-20). 2759B M18 FUEL 1/2” Compact Impact Wrench w/ Friction Ring with ONE-KEY,(2) M18 HIGH CAPACITY REDLITHIUM XC5.0 Battery Packs and Multi-Voltage Charger. Also available as a bare tool (2759B-20).